The Catskills Townhouse is located in the town of Hunter, NY, on Route 23A, directly across from Hunter Mountain. It is located in the Scribner Hollow Townhouse complex. It has a southern exposure, which allows for bright sunshine for the winter, and cool southerly breezes in the summer. The views of Hunter Mountain are fabulous. Pictures of the Townhouse are below. 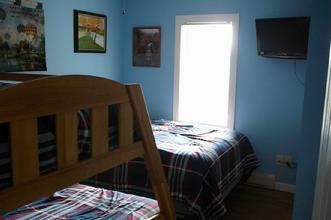 The House Sleeps 10-12 people comfortably. Be sure to visit our New Hampshire properties, located in the White Mountains of New Hampshire, a 4 season resort area. 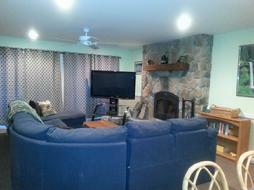 Located 5 hours from NYC with easy interstate highway access. 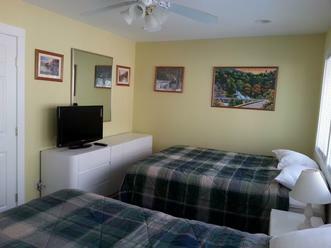 The Master Bedroom has a King Size Bed with direct views of Hunter Mountain, with sliding doors and a balcony facing the mountain and the outdoor pool. There is a fabulous view of the Hunter slopes and a southern exposure. The room has a Color cable ready TV , and telephone. There are plenty of dressers for clothing storage as well as a large closet. This room sleeps 2. The 2nd Bedroom has 2 full size beds plus a twin bunk bed. There is a cable ready Color TV in the room. There is a dresser for clothes storage. The Washer/Dryer combo unit is located in the closet. This room sleeps 5 comfortably. The 3rd Bedroom has 2 Queen Size Beds. The room has a cable ready Color TV. There are dressers for clothing storage as well as a closet. This room sleeps 4 people comfortably. Upstairs on the bedroom level, there is a full bath, along with an extra bath vanity in the bathroom hall. Located only steps away, and visiable from our master bedroom balcony is an outdoor pool, open from memorial day till Labor day. Outdoors we offer a picnic table and BBQ grill for your usage. Location : The Scribner Hollow Community is located in the village of Hunter, NY, directly across from Hunter Mountain. 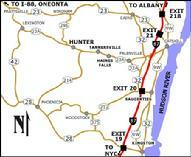 Take Interstate 87 North to exit 20, which is Rt 32. After exit, make left turn onto RT 32 North and follow RT 32 to RT 32A. Continue on RT 32A to RT 23A. Take Rt 23A West to Scribner Hollow Road. Make a right turn onto Scribner Hollow road, and then take the 2nd left turn into the community. We are in the D Building. Additional Pictures of the House are below.